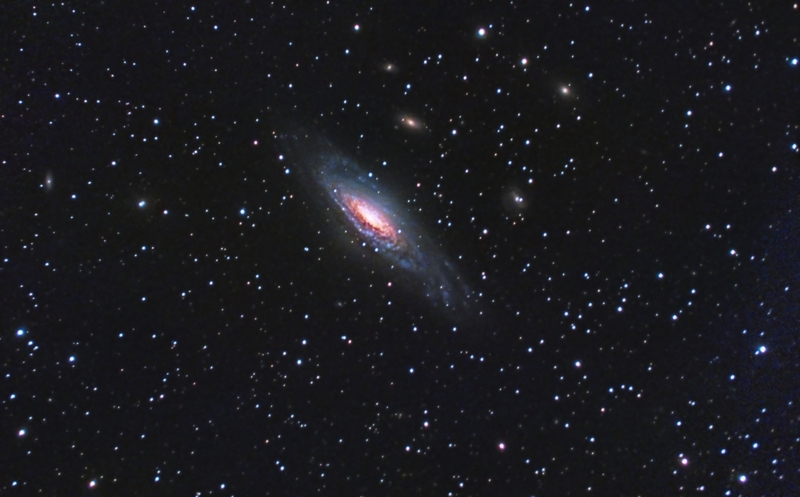 I have posted my latest effort in my image gallery, an image of NGC7331, a famous galaxy in Pegasus. I reproduce the image below. The data for this image were acquired on August 24 and 27, 2014. I encountered some difficulties during processing as some of my subs exhibited an unusual red glow that caused bands in the final integrated image. I am not sure what happened to these subs, but after much trial and error, I found a way to use most of them in my final image thanks to the power of Pixinsight image processing software. But, I still had to discard 176 of the 800 subs I acquired (each of 10 seconds duration). Most of these were not suitable due to blurry/elongated stars that result from unguided exposures on a dobsonian mount. And with the considerable field rotation I experienced during the duration of these exposures, I had to crop most of the field away. The end result is not up to the standard set by those with equatorial mounts with autoguiding. But, my humble collection of images demonstrates that it is possible to achieve reasonable results with a dobsonian telescope. I am the owner of Zephyr Ridge Observatory and the writer of this blog. For more information, please click the About link at the top of this page. This entry was posted in Astrophotography, Missions, Uncategorized. Bookmark the permalink.